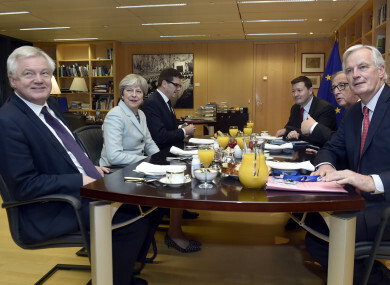 Britain's Secretary of State for Exiting the European Union David Davis, Britain's PM Theresa May, European Commission President Jean-Claude Juncker and EU's chief Brexit negotiator Michel Barnier in Brussels. UK BREXIT SECRETARY David Davis has rowed back on comments he made over the weekend about the border deal Brexit agreed on Friday. Doubt was cast on the landmark Brexit deal - which sets out guarantees that there won’t be a hard border between the Republic and Northern Ireland - after Davis said that the deal was not legally binding. His statement resulted in a spokesperson for the Irish government stating last night that Ireland and the EU would hold the UK to the Brexit agreement. However, trying to calm issues this morning, Davis told LBC radio that his comments had been misunderstood. He said he had meant that the UK would avoid a hard border between Northern Ireland and Ireland even if a final deal did not happen. Of course it’s legally enforceable under the withdrawal agreement, but even if that didn’t happen for some reason, if something went wrong, we would still be seeking to provide a frictionless, invisible border with Ireland. I was making the point it was much more than what’s just in the treaty, it’s what we want to do anyway. When asked about the clarification this morning, Taoiseach Leo Varadkar said he was “delighted” to hear of Davis’ remarks this morning, adding that he was “very happy with the clarification”. At the same event, Health Minister Simon Harris said Davis’ comments at the weekend were “unhelpful” and said the Brexit agreement is binding. Earlier this morning, Northern Ireland Secretary, James Brokenshire, said Friday’s border deal was not legally binding. However, he told RTÉ’s Morning Ireland that it is a “solid commitment” by the UK. Email “Taoiseach 'very happy' David Davis has clarified his remarks on border Brexit deal ”. Feedback on “Taoiseach 'very happy' David Davis has clarified his remarks on border Brexit deal ”.